After a surprisingly quiet post-Monaco period, the boys are gearing up for another event, this time in Canada. With a brief stint at home, we've been given some more behind the scenes glimpses of life as an F1 driver, including the ever-increasing competition between the Mercedes duo over who can do the most insane training. This week we've also got points for amazing shoes, for replacing facial expressions with emojis, and for Felipe Massa who invited another racing driver around his house to play motorsports which his kid. As always, let me know if you spot anything pointsworthy and I'll include it in next week's roundup! +1 Sergio Pérez: Not the first "he's holding my umbrella" joke, but still funny! +2 Jenson Button: Replacing facial expressions with emoji - this is the start of the robots taking over, isn't it? +2 Valtteri Bottas: Enjoying the history of other sports whilst in Canada. 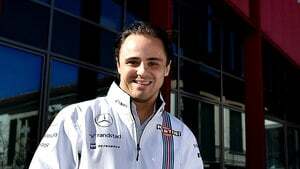 +3 Felipe Massa: Trusting his kid to the pit stop prowess of Pastor Maldonado! +2 Max Verstappen: Spending some extra time in the car in front of his home crowd at Zandvoort. +3 Jenson Button: Great piece on Top Gear, reviewing the latest McLaren road car and showing just how much joy he takes in proper driving. +1 Esteban Gutiérrez: Making an appearance at an F4 event. +2 Lewis Hamilton: Upping the ante in the inter-Mercedes battle of the training - this time Lewis takes to the high seas. +4 Nico Rosberg: Rosberg won't be outdone by Hamilton's sea adventures, though, taking his previous boxing antics underwater! +2 Nico Hülkenberg: Wearing some seriously epic light up shoes.